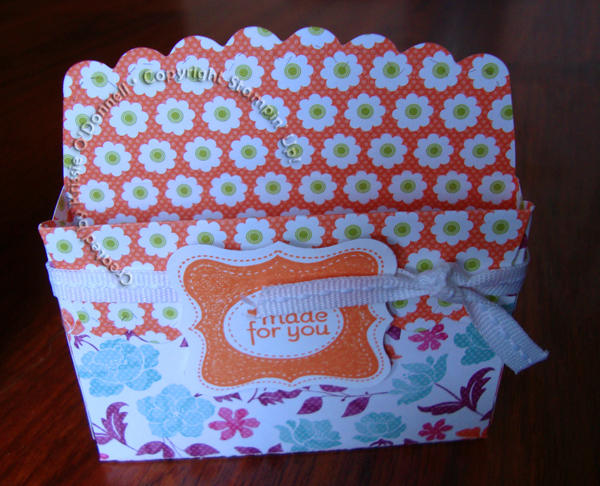 Floral District Scallop Envelope Love Notes Box – sneak peek! Love this little box! My mother-in-law Joanie made me one last year for Easter, and it has taken me quite awhile to make one myself… I used the beautiful new Floral district paper, I really love this particular pattern with the more realistic flowers… and love the colors! Accessories: Whisper White 1/4″ grosgrain Ribbon, Curly Label Punch, Big Shot and Scallop Envelope Die.